Sprouts Farmers Market CEO Amin Maredia plans to leave the company at the end of December. Jim Nielsen, the Company’s president and chief operating officer, and Brad Lukow, the Company’s chief financial officer, will serve as the Company’s co-interim chief executive officers until a permanent successor has been named. 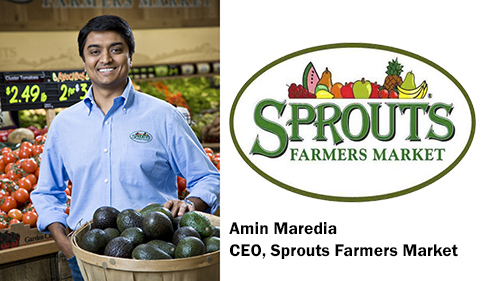 Press Release — Sprouts Farmers Market, Inc. (Nasdaq: SFM) today announced that Amin Maredia, the Company’s chief executive officer and member of the board of directors, will transition away from the Company on December 30, 2018 to pursue other interests. Jim Nielsen, the Company’s president and chief operating officer, and Brad Lukow, the Company’s chief financial officer, will serve as the Company’s co-interim chief executive officers until a permanent successor has been named. The Company is in the process of engaging a leading executive search firm to conduct a comprehensive search for a new chief executive officer. Mr. Marediawill remain available for a period of time in an advisory role to assist with the transition. Mr. Nielsen joined the Company in April 2011 as its chief operating officer and has served as the Company’s president and chief operating officer since August 2015. Prior to that, Mr. Nielsen served as President of Henry’s Farmers Markets from 2007 through April 2011. Mr. Lukow has served as the Company’s chief financial officer since March 2016, having previously served as executive vice president and chief financial officer of Shoppers Drug Mart (SHDMF), Canada’s leading drug store retailer, from 2009 to 2014. Certain statements in this press release are forward-looking as defined in the Private Securities Litigation Reform Act of 1995. Any statements contained herein that are not statements of historical fact (including, but not limited to, statements to the effect that Sprouts Farmers Market or its management “anticipates,” “plans,” “estimates,” “expects,” or “believes,” or the negative of these terms and other similar expressions) should be considered forward-looking statements, including, without limitation, statements regarding the company’s guidance, outlook and opportunities. These statements involve certain risks and uncertainties that may cause actual results to differ materially from expectations as of the date of this release. These risks and uncertainties include, without limitation, risks associated with the company’s ability to successfully compete in its intensely competitive industry; the company’s ability to successfully open new stores; the company’s ability to manage its rapid growth; the company’s ability to maintain or improve its operating margins; the company’s ability to identify and react to trends in consumer preferences; product supply disruptions; general economic conditions; and other factors as set forth from time to time in the company’s Securities and Exchange Commission filings, including, without limitation, the company’s Annual Report on Form 10-K. The company intends these forward-looking statements to speak only as of the time of this release and does not undertake to update or revise them as more information becomes available, except as required by law.